Home » Resources » Is a steel roof right for me? A Kassel & Irons roof offers many benefits including beauty, longevity, wind and weather resistance, energy efficiency, fire safety, and increased home value. At the same time, though, we understand that different homeowners – and homes – have different needs. 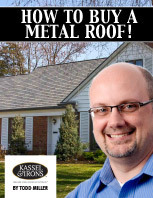 We are here to help you determine whether a Kassel & Irons steel roof is right for you. Please feel free to call us directly or contact us online to discuss this. Following, though, are a few things to consider. How long do you intend to stay in your home? We find a wide variety of reasons why Kassel & Irons customers buy our roofs for their homes. One of the most common though is for the long term benefit. In most areas of the country, conventional roofing materials, regardless of their warranties, are replaced every 12 – 20 years. Because roofing prices historically double every 10 – 15 years regardless of the material, and because labor prices keep going up, homeowners who buy a Kassel & Irons roof now and avoid having to buy another roof in 12 or 20 years will realize a financial benefit to the decision they make now. While a quality steel roof does have greater upfront cost than temporary roofing materials, the payback comes over time. Plus, during the process, you’re enjoying the benefits of a beautiful, worry-free, and energy-efficient roofing system. A trend toward homes being “generational” and passed on as part of the family legacy further supports this idea of investing now in a good roof for the future. What are the things you’d like to accomplish with your new roof? We always suggest that homeowners who are in the process of deciding on a new roof set their criteria. Decide now what you want to accomplish with your next roof, and then make decisions that reach your goals. Do you want a roof that you will never have to worry about? Do you want an energy efficient roof? Do you want a roof that is good for our environment? Do you want a roof that adds beauty to your home? Would you like to invest in a roof that increases your home’s value? These are all things that a Kassel & Irons roof will do for you. If these things are important to you, then we hope you will investigate us further. What are the pitch and design of your home’s current roof? Roofs that are more steeply pitched and complex will require a lot of labor regardless of what material is being installed. With skilled labor, along with associated insurance and other costs, increasing in price on a regular basis, many homeowners with more difficult roofing situations are making long-term decisions now. Do it once, do it right. Additionally, our interlocking steel shingle roofs are ideal for very steep and mansard roofs where traditional shingles, slate, and tile, slip out of place over time. That said, a Kassel & Irons roof requires at least a 3:12 roof pitch and, while our roofs can be used on many arched or bell-shaped roofs, they do not lend themselves well to truly circular or round roofs. Please inquire, though, as to whether we have another solution for you if that is your situation. How important are the aesthetics of your home to you? Most of our customers care deeply about the appearance of their homes. They want their homes to be someplace they can be proud to call home and happy to return to at the end of a long day. In fact, our customers include a wide variety of folks in terms of age, education, life status, and income. The most common things we see are that they care about what their homes look like and they intend to live in them for at least 15 years. That said, again, there are many reasons why homeowners choose our roofs. For some homeowners, the environmental benefits alone of our products are all that drive their decision.